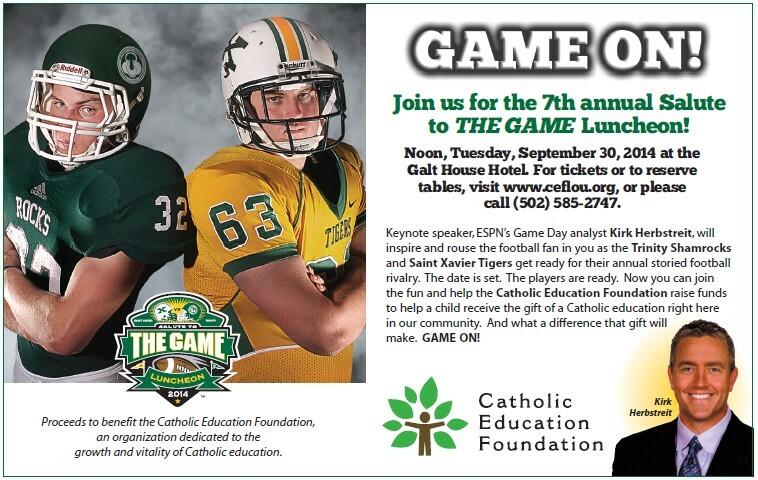 ESPN’s Kirk Herbstreit is back again to speak at the 7th Annual Salute to The Game Luncheon at the Galt House on Tuesday, September 30. Every year this event is put on to help benefit the Catholic Education Foundation and is the week of the big game between the Tigers and Shamrocks. If interested, call soon so you can reserve your spot at this year’s luncheon! Tickets will go fast! Unfortunately the students cannot attend due to it being during the middle of the school day. Don’t worry, SAC will be getting the student body fired up later on that week in the gym at the annual Pep Rally. Posted on September 3, 2014, in Tiger Football and tagged Salute to The Game Luncheon, The Trinity Game. Bookmark the permalink. Leave a comment.